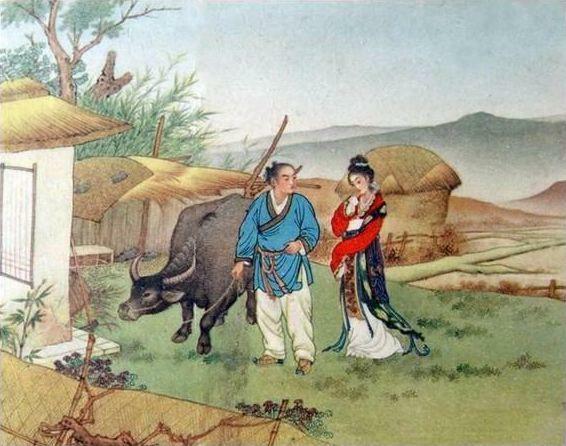 The tale of Niulang and Zhinü, The Cowherd and Weaver Girl, is the most famous love story from China. Their love is celebrated every year in the Qixi Festival, also called Magpie Festival, which falls on the seventh day of the seventh lunar month on the Chinese calendar, in August, and is referred to in the rest of the world as Chinese Valentine's Day. Story: The Jade Emperor has a daughter named Zhi Nu (Weaver Girl). She is most often represented as responsible for weaving colorful clouds in the heaven. In some versions she is the Goddess Weaver, daughter of the Jade Emperor and the Celestial Queen Mother, who weaves the Silver River (known in the West as the Milky Way), which gives light to heaven and earth. In other versions, she is a seamstress who works for the Jade Emperor. Everyday Zhi Nu descended to earth with the aid of a magical robe to bathe. One day, a lowly cowherd named Niu Lang spotted Zhi Nu as she bathed in a stream. Niu Lang fell instantly in love with her and stole her magic robe which she had left on the bank of the stream, leaving her unable to escape back to Heaven. When Zhi Nu emerged from the water, Niu Lang grabbed her and carried her back to his home. When the Jade Emperor heard of this matter, he was furious but unable to intercede, since in the meantime his daughter had fallen in love and married the cowherd. Their marriage was a very happy one, and they had two children. As time passed, Zhi Nu grew homesick and began to miss her father. One day, she came across a box containing her magic robe which her husband had hidden. 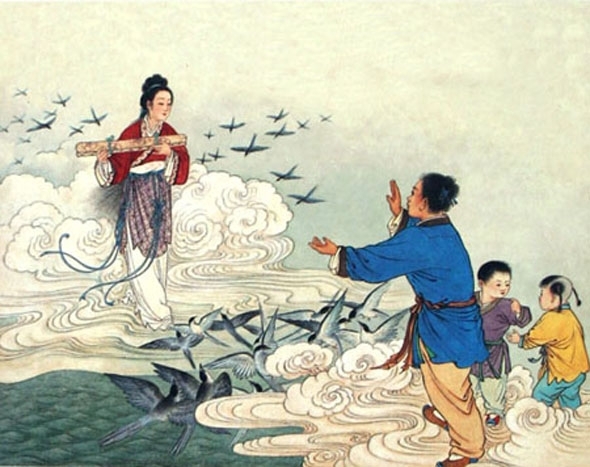 She decided to visit her father back in Heaven, but once she returned, the Jade Emperor summoned a river to flow across the sky (the Milky Way), which Zhi Nu was unable to cross to return to her husband. The Emperor took pity on the young lovers, and so once a year on the seventh day of the seventh month of the lunar calendar, he allows them to meet on a bridge over the river. The story refers to constellations in the night sky. Zhi Nu is the star Vega in the constellation of Lyra east of the Milky Way, and Niu Lang is the star Altair in the constellation of Aquila west of the Milky Way. Under the first quarter moon (7th day) of the seventh lunar month (around August), the lighting condition in the sky causes the Milky Way to appear dimmer, hence the story that the two lovers are no longer separated in that one particular day each year. It was also said that the Goddess of Heaven, out of pity, decided to let them unite once on the seventh day of the seventh lunar month as she was touched by their love for each other. In some versions it is the Emperor of Heaven, or the cowherd's father, or the cowherd's mother have the role of separating the lovers in order for them to focus on their work instead of romance. The star Deneb is a fairy who acts as a chaperone when the lovers meet on the magpie bridge. Rather than once a year, there is another version where the lovers were permitted to reunite once a month. There is also a belief that sometime during the night of Qi Xi, the two stars Altair and Vega will actually unite on the same side of the Milky Way. Qi Xi Festival: Qi Xi (The Night of Sevens), also known as Magpie Festival, falls on the seventh day of the seventh lunar month on the Chinese calendar; thus its name. It also inspired Tanabata (Star Day) in Japan, Chilseok in Korea, and That Tich in Vietnam. It is sometimes referred to as Chinese Valentine's Day. Traditions: On Qi Xi, a festoon is placed in the yard and the single or newly married women in the household make an offering to Niulang and Zhinü consisting of fruit, flowers, tea, and facial powder (makeup). After finishing the offering, half of the facial powder is thrown on the roof and the other half divided among the young women. 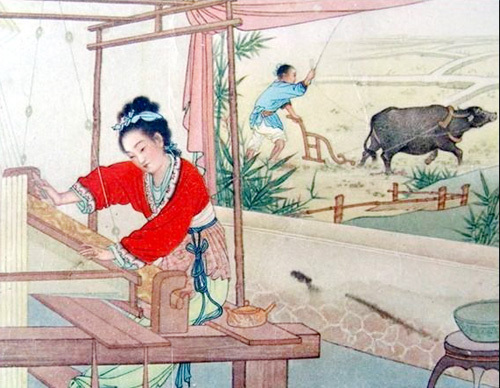 It is believed by doing this, the women are bound in beauty with Zhinü. Another tradition is for young girls to throw a sewing needle into a bowl full of water on the night of Qi Xi as a test of embroidery skills. If the needle floats on top of the water instead of sinking, it proves the girl is a skilled embroideress. 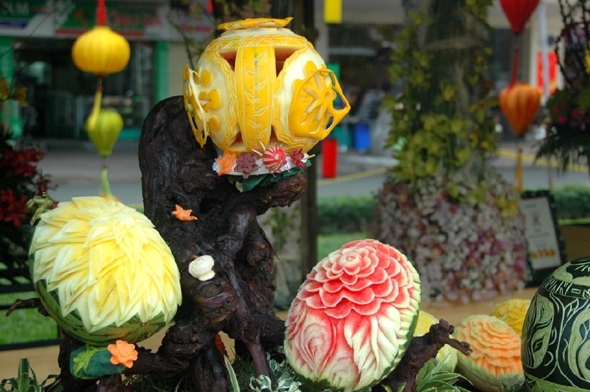 Young girls traditionally demonstrate their domestic arts, especially melon carving, on this day and make wishes for a good husband. Below is the schedule of the 7th day of the 7th month for the next several years. To the right are pictures from recent Qi Xi Festivals. 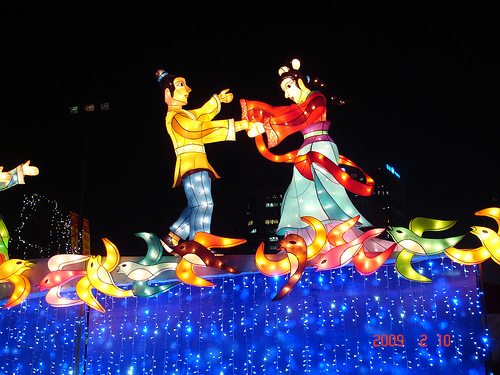 The top picture shows intricate melon carving; the bottom picture is a giant light display of Niulang and Zhinü joyfully meeting on the Bridge Of Magpies.